Merrivale Old Penny Museum at Merrivale Model Village01493 842097work MuseumMerrivale Old Penny Amusement Arcade in Great Yarmouth. 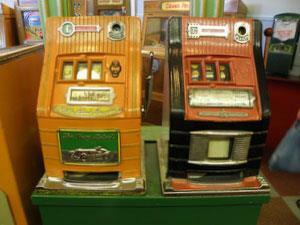 Step back in time and visit our unique Old Penny Arcade. 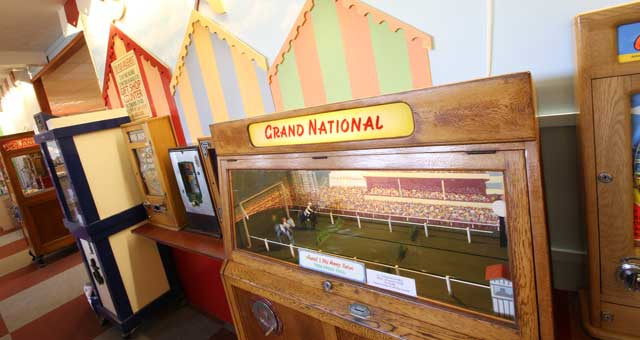 We have a wide range of fantastic vintage slot machines dating from the twenties to the sixties in our Old Penny Museum including old favourites such as the infamous 'Laughing Sailor,' 'What the Butler Saw' (mutoscope) and 'All Wins' machines. Put your penny in the slot and crank the handle, ping the lever, shoot a ball and beat your component! The old time mechanics provide hours of amusement and fun trying to work out how the machine operates whilst admiring their ingenious designs. Merrivale Old Penny Amusement Arcade in Great Yarmouth. Step back in time and visit our unique Old Penny Arcade. Bags of old pennies are available from the Merrivale gift shop for a small fee. Bags of old pennies are available for a small fee.